Lisbeth Larsson-Hytte (later married to Gustaf Brunkman, Djursholm). U. Neergaard, Carl Larsson signerat med pensel och penna, Stockholm, 1999, p. 131, no. 1396 (illustrated p. 466). Stockholm, Liljevalchs Konsthall, Carl Larsson: Commemorative Exhibition, 6 March - 5 April 1920, no. 270. Modum, Stiftelsen Modums Blaafarvevaerk, Carl Larsson: 1853-1919, 6 May - 1 October 1989, no. 65 (illustrated p. 115). Arhus, Arhus Kunstmuseum, Christmas with Carl Larsson, 4 November 1988 - 7 January 1989. Inscribed on the stretcher is a dedication from Lisbett (the artist's wife) to Birgitta Mueller (her daughter): 'Til Birgitta Mueller fran mamma Lisbett/Djursholm 1970'. Bj/orkstammar was executed during the summer of 1910 at 'Bullerholmen', a small island opposite the Larsson home Lilla Hyttnäs (Little Furnace Point) at Sundborn, north-west of Stockholm in the province of Dalarna. A present from Karin's father in 1888, the Larssons used the house as a summer residence until 1901 when they actually moved there to live. From this time, Larsson's watercolours form an idealised image of idyllic country life that is centred almost entirely on depictions of his family at Lilla Hyttnäs. The present work is a preliminary work for the monumental painting that resides in the Norrköping Konstmuseum, Sweden named Frukost i det gröna (Neergaard 1383; fig 1). There are several studies for this major work which attest to the importance Larsson ascribed to the final piece. The natural world was an important factor in Larsson's work over the years. Not only does nature and the landscape feature heavily in Nordic art of the 18th and 19th centuries but also, for Larsson, nature was an integral part of his family life at Sundborn. Whether the family spent their time crayfishing, boating or simply dining al fresco, it was this way of life that the Larsson family had created, that would become the epitomy of Swedish living in the centuries to come. 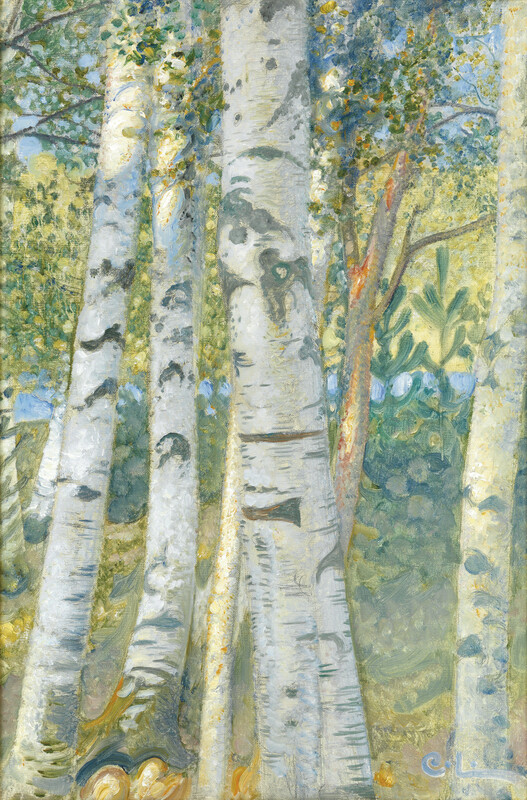 In many of his works Larsson features plants and trees that are so iconic for the Nordic landscape. Many of his most famous works feature the common 'silver birch tree' in the background, that form a backdrop to his figures living out their daily lives, and which make his watercolours so instantly recognisable.